I wanna thank everyone for the welcome's back! Honestly, it brought a tear to my eye and gave me the warm fuzzies :) They probably have shots for that but i don't care...I like the warm fuzzies!!!! Y'all rock!! I mean it!! I said that already didn't I? How dare they break up before I could scrap prom!!! That's just rude! I swear I am going to make that boy an album of all of his ex girlfriends and call it "all the girls I loved before" or "all my ex's" Aren't you glad I'm not your mom??? So, I agreed to not scrap any photos of the two of them together........for now :) Luckily there are tons and tons of photos of him and his bro-skis I can scrap here soon. And I combined a couple of my absolutely FAVE challenge sites for this layout. 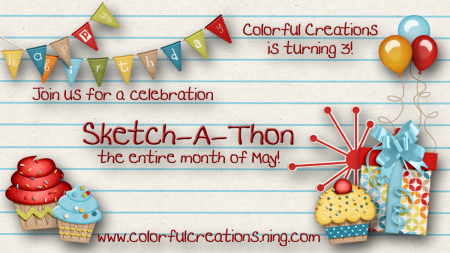 All this month Colorful Creations is having a sketch- a -thon!! They thought they were rid of me....bwahahahahaha!!!! NEVER my pretties!!!!! I will play as often as I can and I will get your little dog too!! 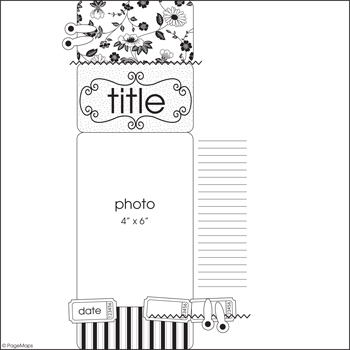 The challenge at LMLC this week is to complete a one photo layout. Super easy for me because that's how I usually scrap. Here is the sketch I chose to work with ......it's the second one of the sketchathon.....I like to work out of order....I'm a rebel that way :) I believe this is a Becky Fleck Pagemaps sketch....I could be wrong, it's happened before. Super simple and perfect for getting my feet wet and getting back into the groove. Over the weekend with all of the NSD events going on in between the Ky Derby and Cinco De mayo and mint julips and margaritas Sweet Shoppe Designs had a little blog train going with a super cool free kit called "That's Life" The collab is HUGE!! Many gave their parts out on Facebook and I haven't reactivated my Facebook yet. So there are parts floating around that I didn't get but the bits I did are sooo dang cute!!! I love these colors because they remind me of Echo Park....and y'all know how I feel about EP!!! And obviously i still love banners too!!! The word "Me" came from a different digi kit from Kate Hadfield and Kim Jenson called "Audaciously Awesome" The stitched down part is actually a word art bit from the SSD collbab as well. The journaling font is barbajoepisanie. And I created this in PSP X.
Whewwwwwwww! All done! Thanks for looking!! Challenges are the perfect way to get the mojo flowing! I don't see any rust either! Great way to combine challenges! Thank you for joining us at Lasting Memories. Love love love love this!!! LOVING that photo and the colors! You are hot Mama!!! Girl, you are BACK!! Omg, I laughed at your post. I've missed you!! You need to chat, vent, you know my email :) I LOVE this LO, Tina! Seriously! This should be your profile pic! You look so happy and the layout is awesome!! So glad to see you at Lasting Memories and hope to see you next week, the week after ... you get the pic. Your spots open when you're ready to come back. I definitely don't see any rust, I only see an AWESOME LO! Challenges and sketches are such great ways to get the mojo flowing again. So glad you're creating again. I love the "all the girls I've loved idea", you should so do it. I am so HAPPY to see you again and I see you still got it! A+! Thanks for joining us at Lasting Memories! oh, pretty! 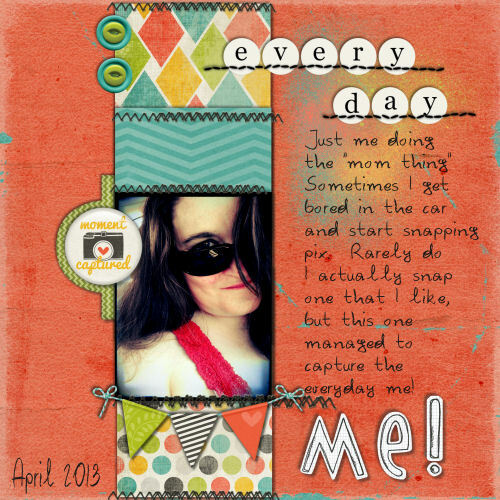 Love the colors and patterns and gorgeous picture of you!